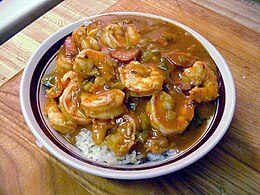 The cuisine of New Orleans encompasses common dishes and foods in New Orleans, Louisiana. It is perhaps the most distinctively recognized regional cuisine in the United States. 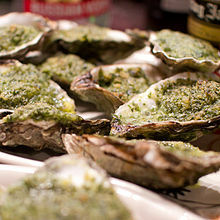 Some of the dishes originated in New Orleans, while others are common and popular in the city and surrounding areas, such as the Mississippi River Delta and southern Louisiana. The cuisine of New Orleans is heavily influenced by Creole cuisine, Cajun cuisine, and soul food. Seafood also plays a prominent part in the cuisine. 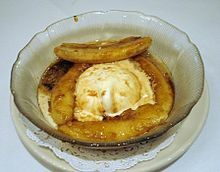 Dishes invented in New Orleans include po' boy and muffuletta sandwiches, oysters Rockefeller and oysters Bienville, pompano en papillote, and bananas Foster, among others. 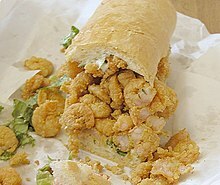 Creole cuisine is a fusion, unique to the New Orleans area, of French, Spanish, West African, and Native American cuisine. It was also influenced by later immigrants from Germany, Italy, and other locations. Like French food, it sometimes makes use of rich sauces and complex preparation techniques. Creole dishes often include onions, bell peppers, celery, tomatoes, and okra. The Cajuns are descendants of the Acadians, French-Canadian colonists who were expelled from the Maritimes by the British. 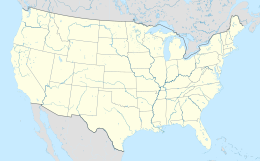 Some of the Acadians settled in rural areas of southern Louisiana in the 1760s and 1770s. The Cajuns spoke their own dialect of French. Some intermarried with other peoples, and so modern Cajuns have some non-Acadian ancestry. 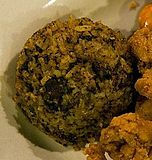 Boudin – A sausage made with pork, rice, and Cajun spices. Couche-Couche – a fried cornmeal dish that is traditionally eaten for breakfast. Ingredients such as eggs, raisins, milk, or syrup are sometimes added. ^ a b Karlin, Adam (April 29, 2014). "New Orleans: the unseen side of the city". The Telegraph. Retrieved November 25, 2015. ^ Johnson, P.; O'Brien, C. (2000). New Orleans. Lonely Planet: World food. Lonely Planet. pp. 11–13. ISBN 978-1-86450-110-0. ^ Bernard, Shane K. (December 8, 2010). "Creoles", KnowLA: Encyclopedia of Louisiana History, Culture, and Community. Retrieved December 16, 2015. ^ Ewell, Barbara, et al. "Kate Chopin – Creoles", Loyola University New Orleans. Retrieved December 16, 2015. ^ Bauman, Harriet J. "French Creoles in Louisiana: An American Tale", Yale–New Haven Teachers Institute. Retrieved December 16, 2015. ^ a b Ducote, Jay D. (April 24, 2012). "Cajun vs. Creole – What's the Difference? ", Huffington Post. Retrieved December 16, 2015. ^ a b Wuerthner, Terri. "Creole and Cajun Cookery: Different Yet Similar", About Food. Retrieved December 16, 2015. ^ a b Beggs, Cindy; Gipson, Bridget; Shaw, Sherrie. "Cajun and Creole Cuisine", University of West Florida. Archived from the original on April 29, 2001. Retrieved December 16, 2015. ^ Bernard, Shane K. (July 26, 2011). "Cajuns", KnowLA: Encyclopedia of Louisiana History, Culture, and Community. Retrieved December 16, 2015. ^ LaBorde, Judy. "A Short History of the Acadians and Cajuns", Louisiana State University Health Sciences Center. Retrieved December 16, 2015. ^ Meaux, Jason (October 14, 2006). "Cajun Country", University of Wisconsin at Madison. Retrieved December 16, 2015. ^ Anderson, Brett (July 3, 2014). "6 Great Soul Food Restaurants in New Orleans", Times-Picayune. Retrieved December 16, 2015. ^ Anderson, Brett (July 8, 2015). "When It Comes to Soul Food, Does Race Matter? ", Times-Picayune. Retrieved December 16, 2015. ^ "African-American History in New Orleans", New Orleans Online. Retrieved December 16, 2015. ^ Anderson, Brett (April 16, 2015). "15 Best New Orleans Seafood Restaurants, from Borgne to Vera's", Times-Picayune. Retrieved December 16, 2015. ^ McNulty, Ian. "LaPlace Is "the Place" for Andouille", WWNO. Retrieved December 11, 2015. ^ Haddix, Carol (February 14, 1985). "New Orleans Blackened Redfish Sets Food World On Fire", Chicago Tribune. Retrieved November 29, 2015. ^ Bragg, Rick (May 16, 2001). "New Orleans Is Singing the Redfish Blues", New York Times. Retrieved November 29, 2015. ^ "Best Boiled Seafood Restaurants in New Orleans", Explore New Orleans. Retrieved November 27, 2015. ^ Darrisaw, Michelle. "Why Boudin Sausage Is Worth a Road Trip to Louisiana". Southern Living. Retrieved April 25, 2018. ^ Billock, Jennifer (September 16, 2016). "Find Out Why Boudin Is Louisiana's Most Famous Sausage". Smithsonian. Retrieved April 25, 2018. ^ Long, Matt (March 6, 2016). "What's Boudin & Why Louisiana Is the Best Place to Find It". Landlopers. Retrieved April 25, 2018. ^ a b c d e f g h i Willett, Megan (February 12, 2013). "10 Dishes That Only Exist In New Orleans". Business Insider. Retrieved December 11, 2015. ^ Eustis, Célestine (1903). Cooking in Old Creole Days (in French). New York: R.H. Russell. p. 108. ^ Cohen, S.; Betancourt, M.; Manville, R. (2007). The Texas Hill Country Cookbook: A Taste of Provence. Globe Pequot Series. Globe Pequot Press. p. 109. ISBN 978-0-7627-4375-9. ^ Claiborne, Craig; Franey, Pierre (November 3, 1985). "Eggs Sardou", New York Times. Retrieved November 8, 2015. ^ Cason, Colleen (February 13, 2009). "From Swamp to Swank: Flavor Elevates Crawfish Étouffée", Ventura County Star. Archived from the original on October 21, 2014. Retrieved December 16, 2015. ^ Dry, Stanley. "A Short History of Gumbo", Southern Foodways Alliance. Retrieved January 1, 2016. ^ Vogt, Justin (December 29, 2009). "Gumbo: The Mysterious History", The Atlantic. Retrieved January 1, 2016. ^ Moss, Robert (September 11, 2014). "The Real Story of Gumbo, Okra, and Filé", Serious Eats. Retrieved January 1, 2016. ^ Dry, Stanley (2009). "Jambalaya", Louisiana Life. Retrieved January 1, 2016. ^ "Maque Choux Recipe", Nola Cuisine, May 12, 2007. Retrieved November 29, 2015. ^ Lempert, Phil (September 17, 2007). "Is the Best Sandwich in America the Muffuletta? ", Today. Retrieved January 1, 2016. ^ Tucker, S. (2009). New Orleans Cuisine: Fourteen Signature Dishes and Their Histories. University Press of Mississippi. p. 63. ISBN 978-1-60473-127-9. ^ Meyer, A.L. ; Vann, J.M. (2008). The Appetizer Atlas: A World of Small Bites. Houghton Mifflin Harcourt. pp. 36–37. ISBN 978-0-544-17738-3. Retrieved November 8, 2015. ^ Jessup Whitehead (1893). Cooking for profit: A new American cook book, Volumes 1-2. Chicago, IL (USA): Jessup Whitehead & Company. p. 170. Retrieved 3 June 2012. ^ Edge, John T. (November 10, 2009). "Saving New Orleans Culture, One Sandwich at a Time", New York Times. Retrieved January 1, 2016. ^ Bienvenu, Marcelle (August 23, 2012). "Pompano Is Traditional en Papillote, but Other Fish Work as Well", Times-Picayune. Retrieved November 25, 2015. ^ "Red Beans and Rice", New Orleans Online. Retrieved November 25, 2015. ^ Meche, Michelle (October 8, 2008). "Good Gravy! That's Rice & Gravy", Ms enPlace. Retrieved November 27, 2015. ^ "Shrimp Creole Recipe", Nola Cuisine, April 13, 2008. Retrieved November 27, 2015. ^ Fitzmorris, Tom (January 21, 2014). "Turtle Soups–12 Best Restaurants", New Orleans Menu. Retrieved November 28, 2015. ^ Price, Todd A. (November 28, 2014). "Ella Brennan, for the First Time in 40 years, Visits Brennan's", Times-Picayune. Retrieved November 25, 2015. ^ "Beignets: From Scriblita to the Big Easy", National Geographic Education. Retrieved November 9, 2015. ^ Rosofsky, Meryl (November 16, 2012). "7 Sensational Bread Puddings in New Orleans", Saveur. Retrieved November 27, 2015. ^ Curry, Dale (September 2009). "Lavishly Layered", New Orleans Magazine. Retrieved September 13, 2015. ^ Nossiter, Adam (January 10, 2006). "And Hubig's Said, Let Them Eat Pie", New York Times. Retrieved November 27, 2015. ^ Baird, Sarah (August 28, 2014). "Simply Delicious: A Case for Huckabucks as the South's Next Big Dessert Trend", Epicurious. Retrieved November 25, 2015. ^ "King Cakes", New Orleans Online. Retrieved November 15, 2015. ^ McNulty, Ian. 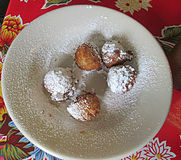 "The Creole Confection – New Orleans Pralines", FrenchQuarter.com. Retrieved November 29, 2015. ^ Morago, Greg (July 14, 2011). "A Tour of the New Orleans' Sno-Ball Stands Nets Some Wondrous Samplings", Houston Chronicle. Retrieved November 29, 2015. ^ Gold, Scott (February 5, 2014). "12 Things You Didn't Know About Crystal Hot Sauce", Thrillist. Retrieved November 25, 2015. ^ Walker, Judy (November 13, 2013). "How to Make New Orleans Favorite Remoulade Sauce", Times-Picayune. Retrieved January 1, 2016. ^ Slater, Dashka (August 29, 2014). "Who Made That Tabasco Sauce? ", New York Times. Retrieved December 9, 2015. ^ Chatelain, Kim (April 7, 2015). "Expansion Completed, Abita Brewing Helping Found Partnership to Compete Against National Beer Brands", Times-Picayune. Retrieved January 1, 2016. ^ Breslow, Peter (June 3, 2006). "Couple Vows to Get Beer Flowing Again in 'Dixie'", NPR. Retrieved January 1, 2016. ^ Waddington, Chris (July 16, 2014). "Bourbon Street 'Hand Grenade': Authentic New Orleans? Experts Say Yes", Times-Picayune. Retrieved January 1, 2016. ^ Price, Todd A. (December 19, 2009). "Sazerac Co. Reintroduces the Original Recipe for Herbsaint", Times-Picayune. Retrieved January 2, 2016. ^ Marszalek, Keith I. (November 30, 2008). "Home of the 'Hurricane' Pat O'Brien's Turns 75 This Week", Times-Picayune. Retrieved January 2, 2016. ^ "Brandy Milk Punch", New Orleans Online. Retrieved January 2, 2016. ^ Price, Todd A. (June 4, 2015). "NOLA Brewing Readies Huge New Tap Room for June 12 Debut", Times-Picayune. Retrieved January 2, 2016. ^ Kamholz, Roger (November 25, 2014). "Peychaud's Bitters: A New Orleans Take on Aromatic Bitters", The Kitchn. Retrieved December 17, 2015. ^ "Ramos Gin Fizz", New Orleans Online. Retrieved January 2, 2016. ^ Boggs, Lindy (June 26, 2008). "New Orleans Declares Sazerac Its Cocktail of Choice", NPR. Retrieved December 17, 2015. ^ Santopietro, Jill (July 15, 2009). "Tales of a Cocktail: Sampling Sazeracs in New Orleans", New York Times. Retrieved December 17, 2015. ^ Clarke, Paul (July 18, 2008). "Time for a Drink: Vieux Carré", Serious Eats. Retrieved December 31, 2015. ^ Dixler, Hillary (September 25, 2013). 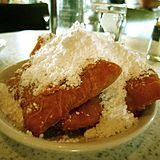 "Café Du Monde's Beignets & Café Au Lait", Eater. Retrieved January 1, 2016. ^ Flory, Brad (October 26, 2011). "Delaware Punch: Here's the Story of a Vanished Soft-Drink Favorite in Jackson", MLive. Retrieved January 1, 2016. ^ "Our Times: Dr. Nut, Popular Local Soft Drink in 1930s, '40s", Times-Picayune, June 23, 2012. Retrieved November 29, 2015. ^ "Business (not) as usual in the big easy: Dorignac's, which re-opened shortly after the devastation wrought in New Orleans by Hurricane Katrina, is seeing more beverage alcohol business than ever". thefreelibrary.com. Retrieved 24 November 2015. ^ MacDonald, Brady (October 31, 2004). "Po' Boy Bliss in New Orleans", Los Angeles Times. Retrieved November 29, 2015. ^ Walker, Judy (July 13, 2015). "The Zatarain's History Behind Its New Facility", Times-Picayune. Retrieved January 1, 2016. ^ Dewandec, Shaila (December 2, 2013). "New Orleans Restaurant Scene Rises, Reflecting a Richer City", New York Times. Retrieved November 29, 2015. ^ "Best New Orleans Restaurants: Critic's Picks", Times-Picayune. Retrieved November 29, 2015. 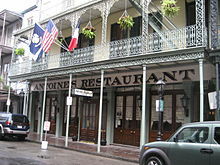 ^ "New Orleans Restaurants", Food & Wine. Retrieved November 29, 2015. Long, L.M. (2015). Ethnic American Food Today: A Cultural Encyclopedia. Ethnic American Food Today. Rowman & Littlefield Publishers. pp. 139–141. ISBN 978-1-4422-2731-6. Meyer, S.; Gilbert, T.A. ; Lagasse, E. (2010). New Orleans Kitchens: Recipes from the Big Easy's Best Restaurants. Gibbs Smith, Publisher. ISBN 978-1-4236-1001-4. 216 pages. Tucker, S. (2009). New Orleans Cuisine: Fourteen Signature Dishes and Their Histories. University Press of Mississippi. ISBN 978-1-60473-645-8. 256 pages.